This is a delicious sauce that brings a touch of spice and flavor to anything you desire. It has a medium spice level, so nothing too hot or overwhelming. The sauce is dark red with chunks of garlic, pepper, and onion throughout. At first taste, it has a well-rounded garlic and pepper flavor with a touch of spice. The heat comes from the Jalapeño and Chili peppers. All in all, it’s a delicious sauce with lots of flavor that leaves your mouth wanting more. I would love to try this sauce in a Bloody Mary….MMM! This sauce is dark red with a thick chunky texture. It looks like a dark red salsa with small chunks of onions, peppers, and spice. It has a delicious garlic pepper scent. It’s not a spicy scent, but more like a yummy mild red salsa. 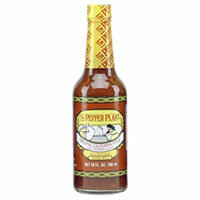 The Pepper Plant Original Hot Sauce has a slight spice to it, so I would describe the heat level as medium. It has jalapeño peppers and chili peppers that give it the spice, but like I said, it’s really more of a medium spice level rather than a super-hot sauce. It’s a sauce that has a very well rounded taste with a depth of flavor. I splashed it on my chicken burrito and it added the perfect amount of flavor. I could taste the Jalapeño pepper, garlic, onion, and chili. It actually reminds me of a spicier version of red enchilada sauce. In my opinion, it’s a great sauce for Mexican food or Bloody Mary’s! The Pepper Plant Original Hot Sauce has all natural ingredients- Jalapeño Peppers, Salt, Acetic Acid, Water, Chili Pepper, Dehydrated Garlic, Spice, Dehydrated Onions, Olive Oil, and Xanthan Gum. This mix of ingredients really rounds out the taste. The jalapeño peppers bring the spice while the onions and garlic balance the flavor. When I added The Pepper Plant Hot Sauce to cooked chicken and allowed it to cook a bit, the sauce developed a well-rounded depth of flavor. Surprisingly, after cooking the sauce on the chicken, the spice actually became stronger. I was able to really taste the Jalapeño mix and peppers. Although the sauce became hotter, it still wasn’t overwhelming or too hot. The 5 oz bottle costs $8.49. That’s a reasonable price considering how delicious it is. We couldn’t find any guarantees on their website.